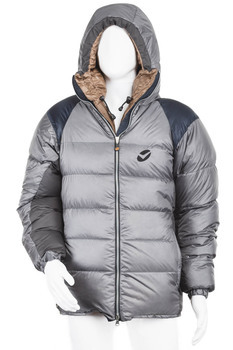 Articulated Down jacket with an incorporated 3D hood. 265g down filling. Assembled by 56 anatomical shaped and pre-cut baffles (3D baffle technology) creating 66 compartments. Inner liner cut in a Medium size (29 Pcs), and outer shell cut in a Large size (37 pcs). "Non down shift" compartment design. Articulated sleeve with CIRCULAR shaped overarm baffles, and OVAL shaped underarm baffles, creating a different contact “feeling” between over and underarm. Inner liner ASAHI-KASEI Nylon 6.6 40g/m2, Outer Nylon 6.6 PU laminated mini rip-stop 45g/m2. 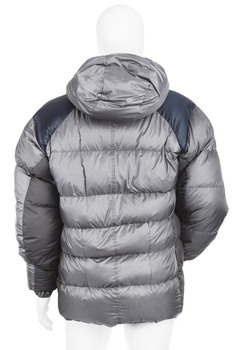 This technology opens up to a new and different dimention in the world of down jacket compartimentation systems. "The Troll is in the box". 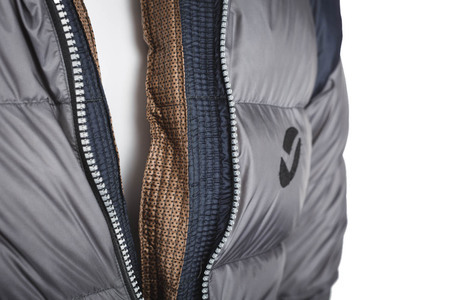 This down jacket is all about its innovative baffle construction. The sophisticated design of its anatomically shaped, pre-cut down chamber compartmentalisation allows the down to loft more fully to offer impressive insulation performance. And it moves well for such a big insulation piece.